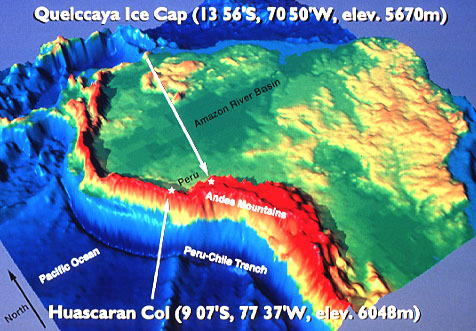 Quelccaya ice cap is located in the Peruvian altiplano at elevations >5600 m (>18,000 feet). From World Data Center for Paleoclimatology (educational slide set). 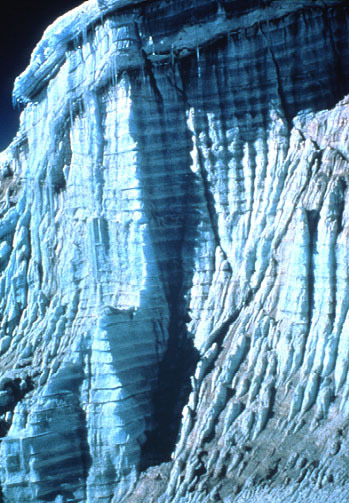 55-m-high ice cliff at margin of Quelccaya ice cap. Annual accumulation layers are clearly visible; they average ¾ m in thickness. In this tropical location south of the equator, most snowfall is between the months of November and April.